I went out yesterday, conditions were great most of the morning and early afternoon. I started off skiing (I know I own a VLX how could I ski??? 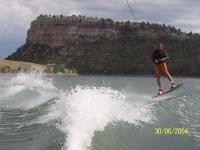 ), then graduated to wake boarding and surfing. Big question, I can not clear or land my jumps on the opposite downslop of the wake. I seem to land right before the wake starts to curve down. This is much harder on the knees. For starters, don't ski first... it only messes up the technique. Back in the day when I skiied and boarded, I found I couldn't edge or pop properly becuase of the different technique for skiing..
Do you have any of the videos? Waketrix or THE BOOK? Go there, they are great. There are so many technique things that you can work on, it would be hard to know where to start w/ you w/out seeing what you're doing wrong. I have the Accurate Redline rope, and I am using it on the shortest setting. To be totally honest I have not idea what length it is, I would guess 50ft. Brad & Pete were able to give me pointers to get across Pete's wake, but for some reason I am coming up short on mine. 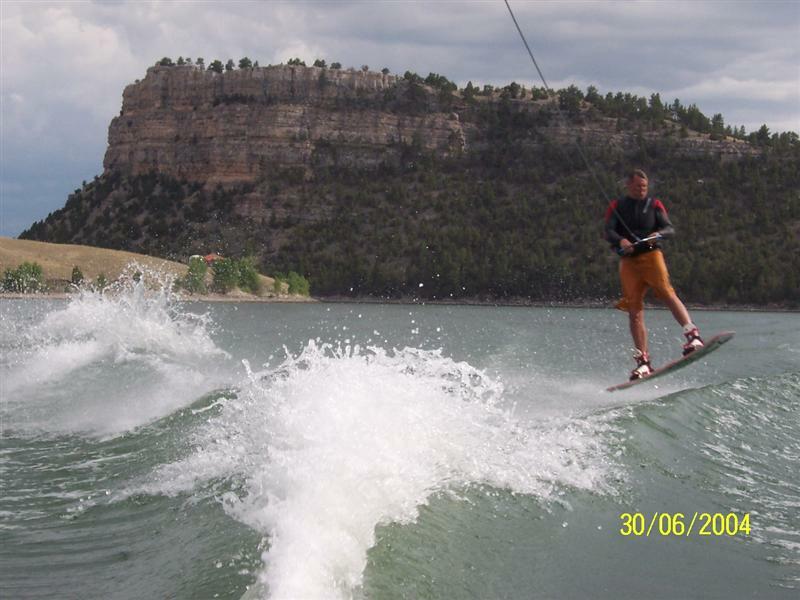 Pete has an older wakesetter, but otherwise everything else is the same. I will definitelly look into the videos. For sure we could Joe - I am far from an expert though... Also note that Pete's boat is shorter & narower than yours, so the wake should be narower also. Do not be afraid of what looks like a mountain in front of you. 4. When you reach the wake, be sure to edge ALL THE WAY through the top of the wake, maintaining the edge all the way through your landing. 5. as you get more comfrotable, extend your legs at the wake to give you the extra pop. and most importantly, make sure you keep the rope low near your waistline/hips. Practicing your progressive edge from the inside to the outside is a good drill to get your muscle memory going and you don't have to worry about hitting the wake. 2. Edge to the outside away from the boat. Once you feel you've got it, then go back to hitting the wake. Get the waketrix video, he has this drill and others in it. Sounds like you a flating the board at the wake, it should be on edge. I have found if when you cut out; as far as you can on your toe edge, to let go with your outside hand and glide, as soon as you feel the boat pull you back to the wake lean back and grab the handle with your free hand this should put you on the proper edge. Remember not to flaten the board and you should get enough pope to clear the wake. When ever I "case" the wake it is almost always due to improper edging. I will sometimes start to roll off my edge as I go up the wake and I always loose my pop. People will also tell you to "stand tall" at the top of the wake. I did this for a long time but I've found another trick that works well as well. Basically you tighten your stomach muscles (like you would when your daring your buddy to punch you in the gut) which somehow stiffens your upper and lower body. I find this technique to pretty easy to do and I don't ever roll off edge as I try to stand tall. Oh yeah, and for my last point, I meant to stand tall, stiffen the muscles (stomach muscels works as well as the legs since they are somehow "tied" together) becasue it is the energy you have built up in your edge and in the rope tension that you want to use to launch off the ramp. Let all of those factors do the work for you. I had been riding on and off for 5 years. Samething, doing everything wrong. Listened to the wrong people and watched the wrong videos. I didn't quite improve as musch as JZ, but in was pretty incredible with only a couple of days of riding. I can't wait to do a week next time. Thanks so much for the advice. I can't wait to get out and practice some more. A couple of other things to try. 1. You don't need a monster cut and come screaming into the wake. Just take a medium cut. 2. Relaxing the board so it sits down in the water when you're the furthest out from the boat is a good thing as others have said. It will ge the board deeper into the water and help you edge as well as let you relax into the initial turn toward the wake. 3. I've found that if you hit the wake at about a 60 degee angle instead of trying to hit it at a 90 degree angle I have much better control and get more air. This is part of a "progressive" turn vs an "all out battle against the boat" turn. 4. You must absolutley keep on edge up through the wake stand tall at the top of the wake. Two points here: If you come off edge before the wake, all the energy stored in the rope is released and ... no pop. If you bend your knees, they will absorb all of the energy you've built up during your turn. 5. While in the air, pull that rope down and in to your hips / thighs. I can't wait to try all of your advice. I was supposed to go out with Andy today, but the weather isn't very good. Definitely I will be out next week. Next week buddy. We'll be flying! don't know how old you are, but try as i do: CHARGE IT! you will get air. i promise. I am not the best at wakeboarding, but I sure enjoy it. We went out today and had the entire river to ourselves. The water temp of 54F may have had something to do with that. I have watched Waketrix several times and have found it to be extremely helpful in teaching others how to wakeboard. I got out behind the boat today and applied some of the principles, as discussed above, and was able to go wake to wake for the first time. I did it twice in a row before catching an edge and smacking the side of my head pretty good into the water. I am pretty psyched for this season. We're going to head out again Friday, unless it is raining. I'm don't know your back ground. I took one lesson from a pro tour guy a year ago (which by no means that I'm any good!). The advice above about a graduated cut, the 60 degree launch rather than the "90 degree launch" and standing up just prior to launch all jive perfectly with what I was taught. The problem I have is un-teaching my legs 40 years of muscle memory. I grew up an snow skis. I've jumped peddle bikes, skateboards, and dirt bikes. In each of those cases you pop approaching the lip. Think about Franz Klamer eliminated the kick on the lead in trailer to Wide World of Sports!! Pop is everything against a hard surface. 1. speed is not king, ridgidity is. 2. pop is not air time, rope tension is. i did that about a month ago trying a surface 180 and my ear is still messed up. it hurt REAL bad. How fast is the boat pulling you at, you should be atleast 18mph. Take a video of your attempts, are you poping right at the top of the wake? Are you running ballast when you are trying? This may sound crazy...but try it with no ballast, it works for me, you are not affraid of the wake, it works. If you feel nice you could take me out on your boat and I'll help you out. You are always welcome. Actually the edging advice worked. I did clear my wake for the first time on Friday. When I was out with Stewart, Kim(Mrs Stewart) was telling me that I was looking down too much as well. So, I definitely have some things to work on.